After revealing its latest earnings, Fitbit appears to be a company that’s running out of breath (and cash) as it tries to keep up with the wearable competition. But the company does have a plan to pull things back, a plan that includes a new business model and a shift towards smartwatches in 2018. In a call discussing its earnings, Fitbit said its planned smartwatch would have ‘mass appeal’ and that though its lineup at the start of the year will lean more towards fitness trackers than smartwatches, its focus will shift in line with consumer interests as the year comes to a close. 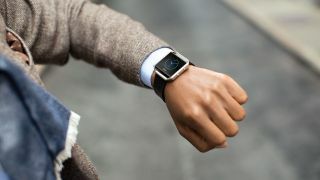 This does of course mean that Fitbit is anticipating that its revenue will continue to drop in the first quarter of the year as consumers shift towards smartwatches but company CEO James Park said he expects the lines between smartwatches and fitness trackers will “continue to blur” which will allow the company’s new smartwatch to drop into the market nicely. The company is also planning to move its business model away from seasonal new product launches and more towards subscription services which tend to yield a more sustained and reliable cash flow. This means Fitbit will spend more time trying to draw in premium subscribers for its paid-for solutions like Fitbit Health Solutions and Fitbit Coach. While transitioning towards smartwatches and long-term services is a sensible approach, in many ways it’s Fitbit's only option if it wants to continue to operate. Despite cost-cutting the company still lost money this year, while on the smartwatch side of the market the Apple Watch appeared to thrive over the holiday season. Consumer tastes are shifting, it remains to be seen whether Fitbit will be able to change fast enough to keep up. Which is the right Fitbit for you?